Martha (of Martha's Favorites) and I have been hosting this tea cup hop since March 8th 2010! We have just passed our two year mark! Can you believe that Martha??? 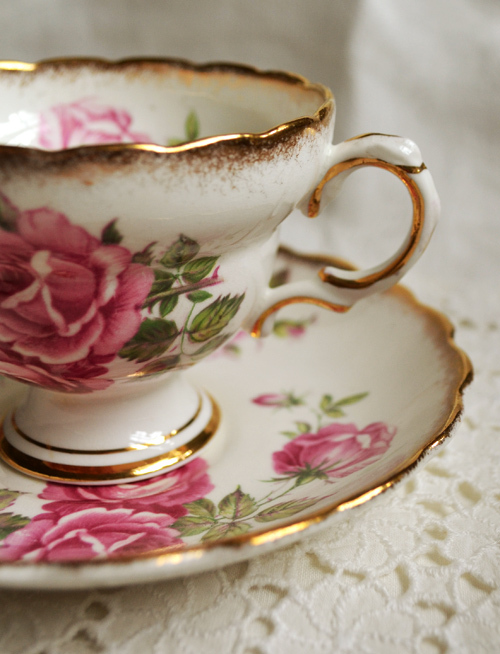 I began collecting tea cups when I was in my 20s. I loved the few sets that I had, but had to let go of most when I moved from Canada to the US. I began to collect again, slowly, once we settled, but with a young family newly located, there wasn't much money for such things. Fast forward many years later, kids in university or all grown with kids of their own, and I am back into the swing of tea cup collecting. I counted over 100 last week! I really thought I had only about 60! Yikes! Of course, I am no where near Martha, Queen of Collectors! Right Martha? When I began collecting in earnest a few years back, Rosina was my favorite to find. I found their designs very romantic. This cup above, with the two lovely roses, is "waisted" and "footed", as you can see. It also shows off lovely gold sponging...and if you have been following T.T. you know I love gold on a cup! The scalloped edges also give this cup extra beauty! The handle is simple with a mild thumb rest and some gold trim. The second Rosina cup has more color with the added Forget Me Nots. Again, we see the gorgeous gold sponged scalloped edges. The handle on this one looks to be exactly the same. Here is a bit of a blurry image of the lovely flowers on the plate. Here is the backstamp, it is the same one as the first stamp so we know they were manufactured around the same time period. The pattern number...3089 is not easy to read and it may be a 5 instead of a three. You can see a sideways 3 by the word "Bone" and a Y by "China". These are the artist marks. Rosina was a pottery in Longton, Stoke on Trent. It used to be the G. Warrilow and Son's Co. (which began in the late 1880s before it became the Rosina company in 1941. 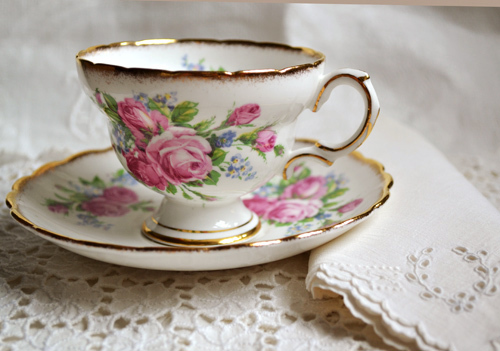 If you would like to share your tea cup with us just go and create a post about it and come back here and sign up with Linky Tools below. Martha and I always love to come and visit you! abraços e tenha excelente terça-feira! Those are two REALLY beautiful teacups! I love Rosina too - so feminine! Your cup&saucers are STUNNING! I love the gold trimmed ones too. AND I also started collecting them when I was in my 20s. In those days there were NO BARGAINS either. BUT I must say the trill of the hunt was "So Much Fun". I DO remember asking favorite relatives THAT HAD HUGE china sets "If I could be HONORED by adding one of their sets to my collection"(I really can't believe I DID THAT!). No one EVER TURNED me down and NOW I have a little piece of them with me ALWAYS! They all smiled as they gave me a set, AND NOW I wonder if they REALLY DID want to part with them. But those lovely ladies are all now in Heaven "AND" I think of them all looking down at me as I have tea with "THEM"! I agree with you that your tea cups and saucers are really beautiful. Every details of those stuff were captured perfectly. Love the gold edges and how it was beautifully crafted. 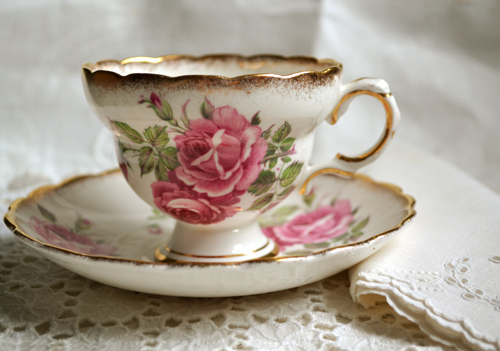 I love roses, so these tea cups really really appeal to me. Romantic, feminine, elegant, they look absolutely gorgeous. Congrats on two years of TT! P R E T T Y Rosina. Thanks for sharing. Hi Terri..wow..this Rosina cup is so very beautiful! !Love the shape of it..it reminds me of a cup my Nana had! Wow how cool you lived in Canada! yay!Gorgeous photos...I am so craving spring/summer! Have a beautiful day and thanks for your kind visit! Terri, your Rosina is GORGEOUS! I had to take a double look to make sure the sets were different. The splash of gold all around just sets this delightful cup and saucer to be enjoyed with style! I am finding more and more that I love the bigger roses. Having tea with you and Martha on Tuesday mornings just makes my day. I never knew you were originally from Canada. 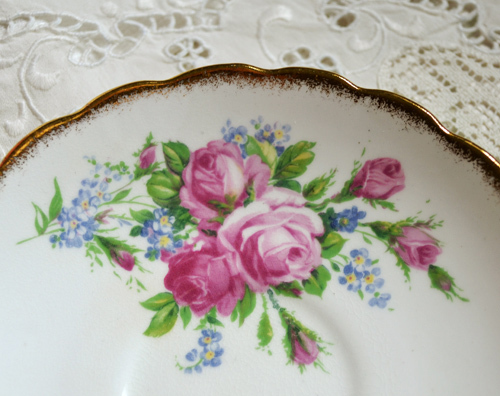 Your Rosina teacup is exquisite! I love the shape of it not to mention the lovely roses and gold trim. She's a pretty thing for sure. I must count my teacups one of these days. I may have more than I thought too. Thanks for sharing and enjoy your day. Oh these are beautiful! 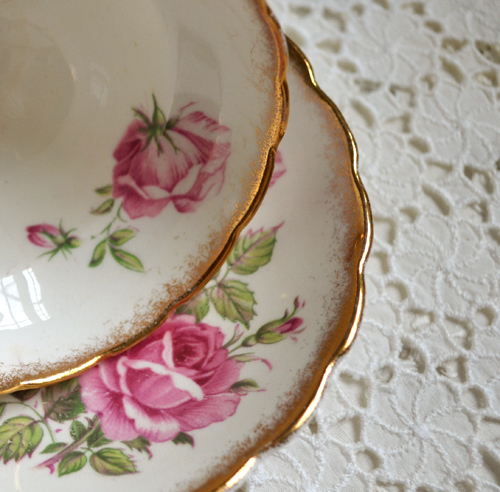 I think the Rosina teacups are my favorites. thank you for sharing and have a lovely day. They are beautiful. I especially love the addition of the forget-me-nots! Love that little touch of another color. You have a great collection, Terri! Happy Birthday To You ... On a successful Teatime Blog... I'm so pleased that I'm able to join you for these fabulous teas. Oh, I absolutely LOVE your teacups you shared with us today! I can understand why this has been a favorite of yours! I would love to find one someday to add to my small collection (wow! 100!) I think I currently have about 20 different styles, not counting the matching sets. 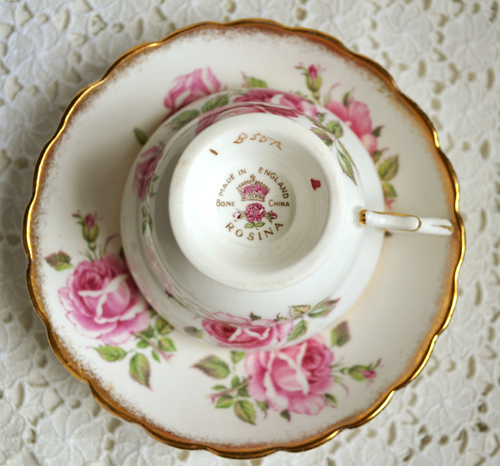 This Rosina teacup is gorgeous. I do love roses! Happy Tea Day and thank you for hosting! Rosina has always been a favorite. They made lovely china! Yours are great examples! I like the one with the blue in the design...of course! Hope you have a wonderful day! WOW Terri, Over 100!! How do you display them all, or do you - LOL! you an Martha are both great collectors. I love to see your treasures and the Rosina cups are both very charming. I can't believe that I missed last week to link in. I don't know why, its almost to much here. I hope, everything is o.k. with Martha, her tea post is not online yet. 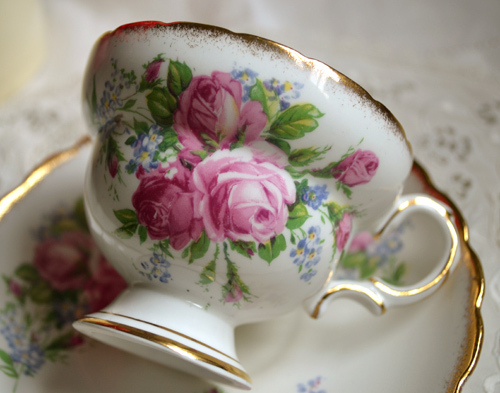 Thank you for sharing this fabulous tea cups and for hosting this event. 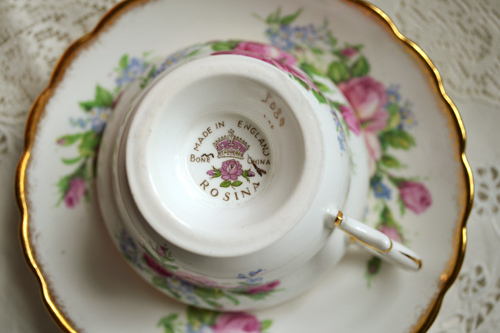 Your Rosina tea cups are beautiful. I love the delicate design and the floral's are so pretty. You have quite the collection... 100 teacups :) Thanks for hosting. 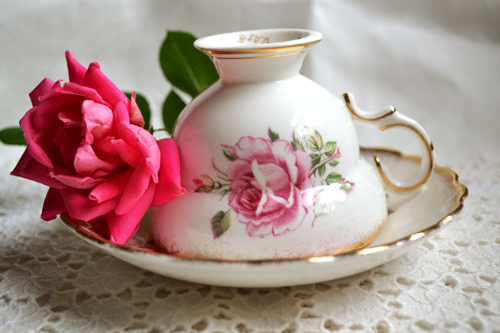 Gorgeous tea cup and gorgeous pictures! I haven't heard of Rosina before so I'll have to look out for it. Best wishes and thanks so much for having me. Those are quite exquisite. I must admit I have a fondness for forget-me-nots, os the second is my favorite. It is going to be hard for you to pick which to pass on. I am almost speechless from the beauty of these teacups! They are so delicate and fragile looking. You have a true treasure there! 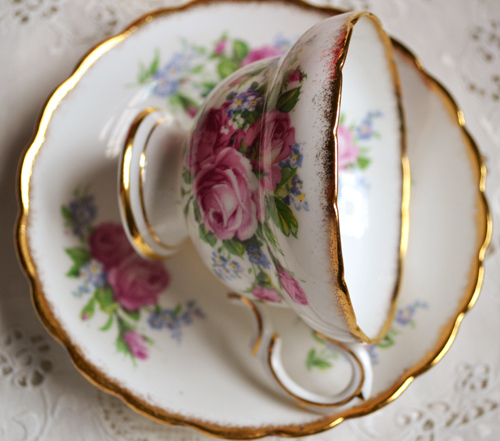 Thank you so much for sharing them today :) I am loving being a part of Teacup Tuesday's! Oh Terri, your tea cups are exquisite! They both have such a beautiful shape, and I love the roses, and beautiful gold edging. Hi Terri...oh, I love your teacup pattern. You certainly know how to photo a teacup! Great job.Thanks for your artistic post. I just happen to have a tea cup of sorts posted for today, so I thought I'd throw my link on with all of the others...I'm going to have fun visiting ... so many tea cups varieties, so little time! thanks again for hosting yet another successful week. Your cups are always gorgeous...and your photos are a delight to behold...you showcase them beautifully! Thank you for hosting this fun party. 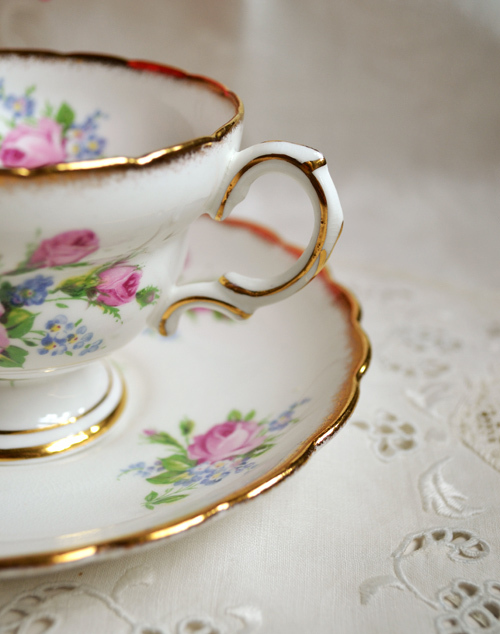 You have two beautiful teacups to share this week. I enjoyed learning about them. Oh that second Rosina cup is just too too lovely! Thank you for your kind comments. You are such a blessing to me.